Need need need to get fit!!! Buy a load of NEW sportswear of course … that we will NEVER wear. Or ONLY for that first week or month whilst the passion takes us. Before we revert to our everyday. And forget the exercise. And the new sportswear. And we do it with so many of our fads don’t we? About ourselves. Or our lives. So what do we do? We buy stuff. And it doesn’t help does it? And have nothing to show for it but MORE clutter. 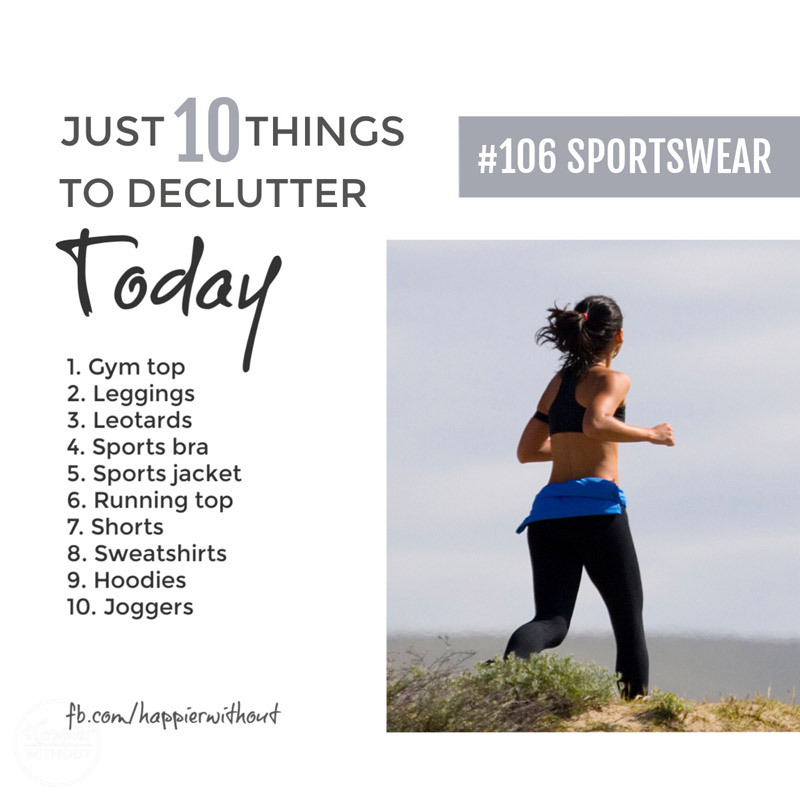 So today we’re going to declutter our unworn sportswear. And remember real change comes from inside. And is NEVER on offer in the store. We can add today’s clutter to our charity bag with our jeans, sweaters, knitwear, night clothes and skirts from the last five days. Or if you’ve got very good stuff you may be able to shift it locally and quickly on Facebook. And if you still really do want to up your fitness, remember THE best exercise ever is walking. It strengthens core muscles, reduces blood pressure and blood sugar, cuts stress and anxiety. And you don’t need ANY new kit for it. Which means NO new clutter.